Compressed air is often generated at the compressor's maximum pressure (often 7 bar, 100 psi). Reducing pressure by 10% can lead to 5% savings in energy. Make small, incremental reductions, checking that operations are not affected. At PCM Air Division we can provide a full in house ultrasonic leak detection service. Our Ultrasonic detection equipment is the most convenient and efficient way of checking for and measuring compressed air leaks, we provide our customers with a full report covering, location, air wastage costs and quotation for repair. We have often found payback for cost of repairs to be measured in days. Your site survey report will show you quickly repairing leaks will pay for itself. Can your compressed air be delivered more efficiently? If compressed air is appropriate for the job, could it be delivered more efficiently? For example, many blow guns are simply open-ended pipes: fitting a venturi-type nozzle can use 30% less compressed air, and, by making the operation much quieter, improve the working environment. An idling compressor can use around 40% of its full load amps. Where appropriate, turn compressors off when they're not being used (for example during tea breaks, and certainly overnight), to save energy. At PCM Air Division we can advise you on the correct air treatment. Treating air to remove dirt, water and oil is necessary but uses lots of energy. Treat the application rather than the whole system. Make sure your compressed air treatment is appropriate for your application. 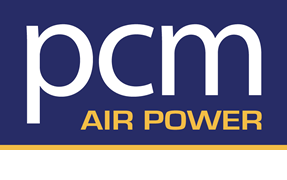 At PCM Air Division we can help you decide what size air compressor you need, or to establish how efficient your existing system is, firstly we need to analyse the existing demand. Find out how it varies over a representative period, and how any existing compressor set up meets that demand. We do this by installing our data logging recorder to log air flow, power consumption and the on/off load cycles of the existing air compressors. This is done by our trained engineering or sales staff. The recording is usually taken over a typical week’s production. This will give us your air demand profile, together with existing running costs and highlight where potential energy savings maybe made. We will produce a full report and analysis of our findings together with any recommendations.